A thick, tomato based sauce with a delicious, herby sweet flavour. A rich, tomato-based sauce with an aromatic and herby sweet flavour that's perfect with Chicken, Lamb or Vegetables. Quick and easy, Chilli rating - Mild - 1, suitable for vegetarians and vegans. 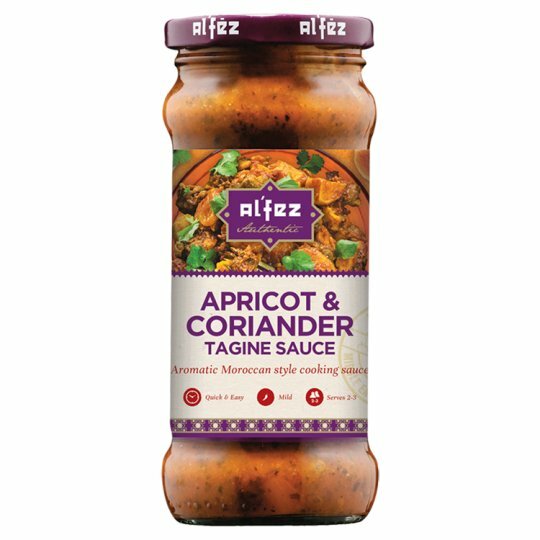 Ideal for creating a classic Moroccan Tagine stew. Tagine Sauce: Lightly brown choice of meat or vegetables in a pan. Add sauce and up to 1/2 jar water, cook for 1-2 mins. Reduce heat, cover & simmer for 15-20 mins, stirring occasionally. Serve on a bed of rice or couscous. Pour over sauce: Cook over medium heat for 4-5 mins until hot, stirring occasionally. Pour over rice, couscous, cooked meat, vegetables or as desired.